I cannot guarantee many things, but I'm pretty confident that you have encountered conflict in your marriage (if you're married). Every married couple has struggles. Melding two minds, two bodies, and two spirits into one unit is a tedious task. It requires patience, dedication, effort, love, and mercy. "Responsibility" isn't the most fun word in the dictionary. We'd prefer to describe marriage with other nouns, like "passion" or "enjoyment." We'd like to say that marriage is bliss, excitement, companionship, and friendship. And all of those things should be true. But when conflict arises, most of those nouns float away; and we're left with frustration, anger, and perhaps indifference. It can happen from big, traumatic events that throw the marriage into a tailspin; or it can happen from little, unresolved issues piling one on top of the other for months and years until it breaks your backs. Regardless of how it happens, someone in the marriage (or hopefully both) needs to take responsibility. They need to take initiative to figure out what went wrong and make it right. In 7+ years of marriage, my wife and I have had some conflict. We've had some frustration and anger. Why? Because we are human and live on planet Earth. Of course, I will write this post from a husband's perspective. I hope it will be helpful to both men and women, but I believe there are some special responsibilities that men ought to bear. Here are five ideas that have helped me in our marriage. I know communication is important in marriage, but there are times when it's best to get out some proverbial duct tape and fasten your mouth closed. You know when those times are too--when you have nothing but accusations, blame, and negativity to spew. You cannot unsay your words. You can only apologize. #2 Reflect on the situation. While you're not lathering your spouse with hurtful words, you can be spending some time alone reflecting on what initially caused the conflict. Perhaps you're under unusual stress. Perhaps one or both of you have been lacking sleep. Perhaps you inadvertently did something that hurt your spouse's feelings. Only you can do this. You cannot ask a friend or counselor to tell you "what went wrong." They weren't there! And they don't know your spouse like you do. You must incorporate what you know about your spouse into your reflection. 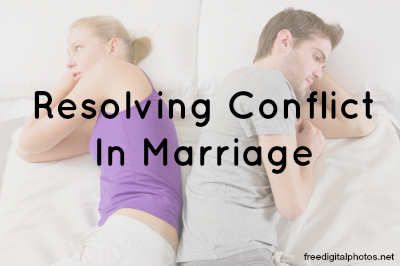 I can recall conflicts in our marriage in which this time of reflection was the pivotal to me realizing what was the root cause of the problem. Once I knew the problem, I knew what can be done to resolve it. Note: For newlywed couples, you may not know much about your spouse yet (though you thought you did). During your reflection, it's important that you come up with questions for your spouse so you can learn more about her. These questions may be best asked after the conflict is resolved though. Also, if you are a Christian, this would be a great time for you to pray about the situation. Ask God to show you your mistakes and to intervene. Pray for your spouse--that they will respond properly and that you can come together and resolve the issue. You might not be like me, but I don't like taking blame. I prefer when other people do that. But part of being an adult is realizing that you could have handled things better. It's not about "right" or "wrong" in marital conflict. It's about, "Why is the team not working together?" Did you really do everything you should have done in the best possible way? Of course you didn't. And if you think you did, you have bigger issues. We can all improve. So when I reflect on our conflicts, I realize that I could have been more proactive. I could have been more thoughtful, less rude, more concerned, or better informed. I could have remembered. I could have been a better husband. This might sound like I'm always blaming myself, but that's not it at all. I realize that my wife isn't perfect either. In my opinion, every conflict in our marriage has resulted from mistakes that both of us made. "I'm sorry that I forgot about the (you name it) and didn't adjust my schedule." "I'm sorry I didn't listen when you told me (you name it)." "I'm sorry I wasn't considerate of your feelings. I know you you don't like when I (you name it)." Depending on the offense, this can be fairly easy or extremely difficult. Forgiving someone who has hurt you, especially someone you trust, could be one of the most difficult things to do. I make no claims to be good at this. But at least I know it's the best thing. If you cannot forgive, your marriage will not last--at least not happily. You might stay "married" legally for some reason, but not because you love your spouse. How can I "forget" a conflict? Clearly I have not forgotten about all our conflicts, or I wouldn't be able to reflect on them and learn from them. But I do agree not to bring those conflicts up in conversation. If you are the type of person that records all offenses and retains them for the purpose of leveraging them against your spouse, you (and your marriage) are headed for trouble. Bringing up past conflicts is a great way to start new ones. Don't be stupid. Title image from freedigitalphotos.net and edited with picmonkey.com.